I told you there is something special coming today and here it is: my first Hidoku puzzle! These puzzles have been introduced earlier this year and it seems they’re catching on. They are being published under the name “Hidato” but I will have to use Hidoku. 1. It can be played on a square or rectangle of any size 2. 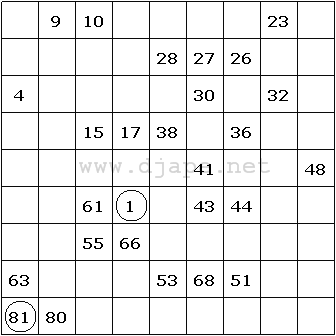 Numbers from 1 to the size of the puzzle are used. 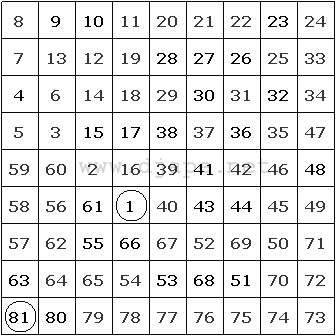 For example, for 9×9 puzzles, numbers from 1 to 81 are used. 3. First and last numbers are always shown in the puzzle and they’re circled. 4. Now, the main rule: consecutive numbers MUST BE adjacent to each other, horizontally, vertically OR diagonally. Therefore, there is a connected path of consecutive numbers from 1 to 81 (or whatever the size). Your job, of course, is to fill in all the numbers. 9×9 Hidoku for Friday, October 24, 2008. This entry was posted in Free sample puzzles, Puzzle variants and tagged CONSECUTIVE, hidato, hidoku, rules. Bookmark the permalink. Post a comment or leave a trackback: Trackback URL. Pretty neat! Took me 20 minutes or so but I bet they could be a lot harder… I like all the variations you keep adding to the site!